If you are interested in Birding Diving Snorkeling Corn Islands Guided Tour, come and join us at Kaiyote Tours! We love Nicaragua, we have spent more time in Nicaragua than any other country and we have been traveling to this wonderful place since 2005. It is our home away from home, so why not travel with us! The Corn Islands are located 50 miles of the east coast of the Nicaraguan mainland and have a long maritime history. The islands are famous for the pirates of the 17th and 18th centuries; pirates such as Henry Morgan. Before the pirates, the islands were inhabited by a cannibal tribe and sailors referred to the land as “The Skeleton Islands”. The islands fell under British rule from 1655 - 1860. 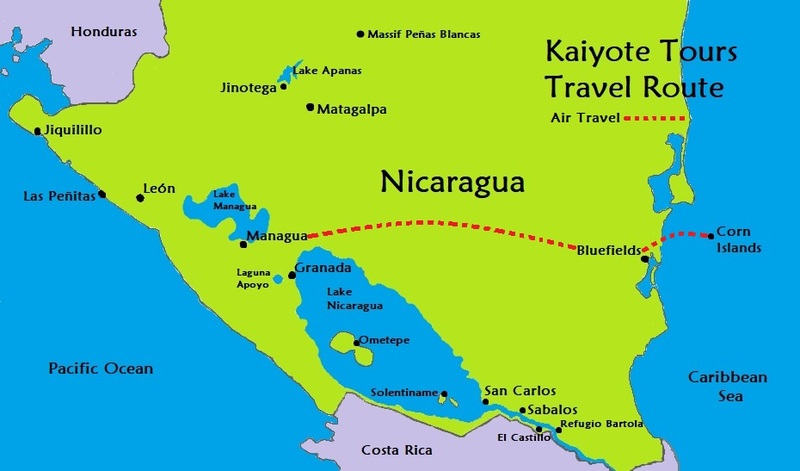 Nicaragua claimed the islands in 1894 and leased the land to the United States from 1914 – 1970. These days life on the islands is very laid back and fishing and tourism are the main industries. The islands are surrounded by reefs and numerous shipwrecks which have made the area a great destination for snorkeling and diving. Snorkeling and swimming in the warm and clear Caribbean waters of the Corn Islands. Watching giant Magnificent Frigate birds soaring high in the sky above. Getting that Caribbean vibe and having the best day ever and feeling more relaxed than you have in a long time! Travel Dates: September 3 - 12, 2020 and by special requested dates. Special offer: Included with your trip (one per room) is a copy of the field guide “Birds of Nicaragua” second edition by Lilliana Chavarria-Duriaux, et al. You will receive this when you reserve your trip so you will have time to study and know the beautiful birds of Nicaragua. Arrival in Managua; flights usually arrive in the evening at the Managua Augusto Cesar Sandino International Airport (MGA), so we will head directly to the Las Mercedes Hotel for a relaxing evening among the pools and gardens. There are two great birding areas just outside of Managua that we will visit today: Chocoyero - El Brujo Natural Reserve and Montibelli Natural Reserve. These reserves offer great birding and walking and both centers have wonderful porches to sit and wait for the birds to come to you, if you choose. From Managua it is a one hour flight to Big Corn Island. From Big Corn Island it is a 30 minute boat ride to Little Corn Island. We will be spending four nights at Hotel Los Delfines. It is a wonderful paradise and the staff and owners are great. Crystal-clear and warm Caribbean water, it just was what you would expect. We will have three full days of activities choices: Snorkeling, Diving, Birding, Kayaking, Fishing, paddle boards, yoga and Horseback Riding. The food on the island is excellent with great fresh fish and local dishes. Today will be a full day of activities of your choice. Or you can choose to do nothing and relax the whole time. The cabins and beach here were created to instill a great sense of serene beauty and tranquility. Little Corn Island is very small (about 2 sq. mile), there are no cars and the only way to get around is by boat or foot. About 800 people live on Little Corn Island. On our last day on Little Corn Island, you will have the “usual” choice of activities: Snorkeling, Diving, Birding, Kayaking, Fishing, paddle boards, yoga and Horseback Riding. It is 10 miles from Little Corn Island to Big Corn Island and the “panga” water taxi trip takes about 30-minutes. In the afternoon we will head back to Big Corn Island and we will be staying at the Paraiso Beach Hotel for the next two nights. Big Corn Island is the main port, with nearly 6,000 residents and covers about 4-square miles. The island has beautiful beaches, eight miles of roads, plenty of taxis and an airport. There are great restaurants and beaches on Big Corn Island. A 1-hour flight will find us back in Managua at the Las Mercedes Hotel where we will spend our day relaxing among the gardens, swimming and looking for birds. In Managua, across from the hotel at the airport is excellent shopping as well.